Righteous Philaretos the Merciful, son of George and Anna, was raised in piety and the fear of God. He lived during the VIII Century in the village of Amnea in the Paphlagonian district (Asia Minor). His wife, Theozua, was from a rich and illustrious family, and they had children: a son John, and daughters Ipatia and Euanthea. Philaretos was a rich and illustrious dignitary, but he was not hoarding of his wealth. Knowing that many people suffered from poverty, he remembered the words of the Saviour about the dread Last Judgement and about "these least ones" (Mt. 25: 40); the words of the Apostle Paul about the fact that a dying man takes nothing along from this world (1 Tim. 6: 7); and the verses of king David about the reward of the righteous (Ps. 36: 25). And Philaretos became famed for his love for the poor. One time Ishmaelites (arabs) made an attack on Paphlagonia, devastating the land and plundering the estate of Philaretos. There remained only 2 oxen, a cow, some oil and the house. But this also, finally, he shared with the poor. Mildly yet stubbornly he endured the reproaches of his wife and the jeers of his children. "I have in secret places unbeknownst to you, such riches and such treasure, – he replied to his family, – which would suffice you, even if ye live an hundred years without toil and without concern". And the Lord rewarded Philaretos for his generosity: when the last measure of wheat was given away, a old friend sent him forty measures, and after this, as warm clothing was given to the needy, riches returned to him. During this time the Byzantine empress Irene (797-802) was seeking a bride for her son – the future co-reigning Constantine Porphyrigenitos (Bagryanorodnii) (780-797) and for this emissaries were sent throughout all the empire. And the envoys did not bypass Amnea. When Philaretos and Theozua learned that these most illustrious guests were to visit at their house, Philaretos was very happy, but Theozua was sad, – at the house there was no always even food, and suitable entertainment was impossible. But Philaretos bid his wife to finely decorate their home. Their neighbours, knowing that imperial envoys were being expected, brought everything in abundance for a rich feast. The envoys made their choices for the imperial bride selection: amidst the 10 most beautiful maidens was Philaretos' grand-daughter, Maria. This very Maria exceeded all her rivals in quality and modesty and indeed became the regent's wife, and Constantine Porphyrigenitos lavished rewarded Philaretos. And thus fame and riches returned to Philaretos. But just as before, this holy lover of the poor generously distributed alms and established an eating place for the poor, and he himself served them at the time of the meal. Everyone was astonished at the humility of Philaretos and said: "In truth this is a man of God completely, a true disciple of Christ". He ordered a servant to take three chests and fill them separately with gold, silver and copper coins: from the first the totally destitute received alms, from the second – those having been robbed of the means of subsistence, and from the third – those who hypocritically coveted money. Thus, not caught up in honours, but rather in humility and love for the poor, the blessed elder attained 90 years of age. Foreseeing his end, he set off to the Constantinople Rodolpheia monastery, distributing there everything that he had on himself, for monastery needs and for the needy. Having summoned his family, he exhorted them in love for the poor and non-avarice; he then expired peacefully to the Lord. 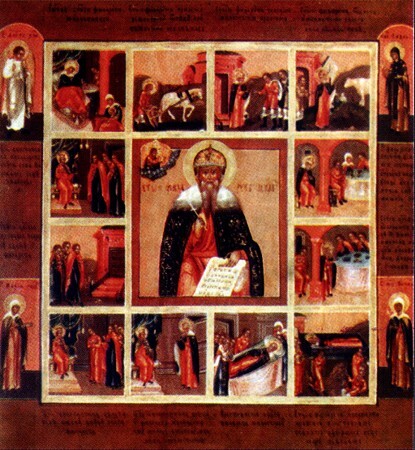 He died in the year 792 and was buried in the Rodolpheia Judgement monastery in Constantinople. The appearance of a miracle after his death confirmed the sainthood of Righteous Philaretos. When they took the body of the saint to the place of burial, a certain man, possessed by the devil, took hold on the coffin and followed with the funeral procession. At the cemetery occurred the healing of the demoniac: the devil threw the man down on the ground and went out from him. Many other miracles and healings also were done at the grave of the saint. After the death of Righteous Philaretos, his wife Theozua worked at restoring monasteries and churches devastated during the time of a barbarian invasion.